Astrosage brings you a user-friendly printable version of 2019 Calendar. Printable calendar 2019 would be a consolidation of days, weeks and months which will prove beneficial for you to plan out your activities accordingly. 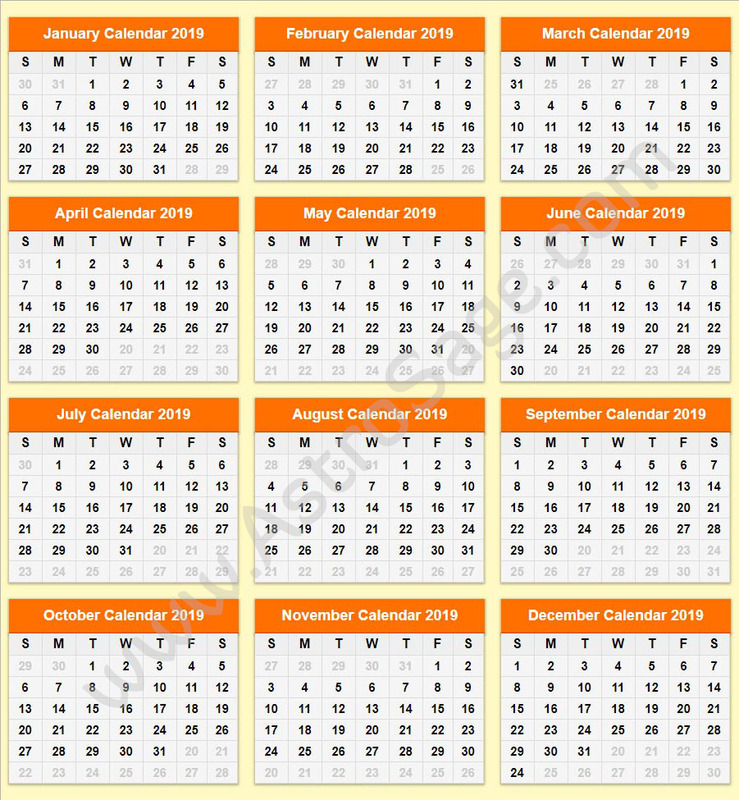 One should go through this article thoroughly to get additional information about this printable calendar 2019. Every morning when you wake, before going to the bed or at any hour of the day, whenever you want to do any of your important work, then the foremost thing which you would always like to peep at is a calendar. While scheduling for any business meeting or any auspicious work, you opt for a Calendar. If you don't outline your motion properly you might end up screwing everything. To always be appropriate and on time you have to have the access of a calendar which will let you to layout your movement beforehand. Hence, here at Astrosage, we have tried to bring this monthly calendar 2019 at the click of your fingers tips, so that it becomes easy for you to trace your day to day paramount events of your life. With this printable calendar, you can start planning out your bustles, conduct your work sprucely and systematize yourself in a perfect manner. Our experts at Astrosage, have designed this printable calendar 2019, or can even more precisely annotated as the monthly calendar for the year 2019 which is adapted after a lot of research and extensive paperwork. Therefore, impeccably this would be an ultimate resource for everyone who wants to access this printable version of the calendar for strategizing or managing their activities. You can directly download it or save it on your phone, laptop or computer and can even take a printout if you like the hardcopy version. A calendar is a form of classification of days, months or years for social, commercial, religious, or administrative purposes. It is set up in a format by denoting names to the periods of time, such as days, weeks, months and years. Whereas, a date is the alias of a particular, definite day within such a system. A calendar is also a material record (often paper) of such a system. A calendar can also signify a list of planned events, in a partial or fully chronological order. Periods in a calendar are synchronized with the cycle of the sun or the moon. Primordial documents and inscriptions, such as the ones from Rome and China, had included the early forms of calendars. Printing gave an ascend to a lot of allied types of publication, which could track dates, of which calendars are just one. The others such as almanacs, which is nothing but an annual publication that lists a collection of events forthcoming in the next year, the dawn and dusk timings of the Sun and the Moon, dates of eclipses, hours of high and low tides, and other religious festivals. In the deficiency of accurate clocks, calendars played a dual role as timekeeping aids - by noting the times of sunrise and moonrise, they also helped farmers tell the time while in the fields. A calendar is mainly used to exhibit the dates and any related information to it, usually in a tabular format. Calendars are widely used by every individual to plan out their future events and keep a track of their appointments, and hence, an archetypal calendar would usually include days of the week, week numbering, months, bank holidays and public holidays. Calendars in relic were lunisolar, which were dependent on the preface of intercalary months to align the solar and the lunar years. This illustration was mostly stationed on observation, but there may have been early attempts to sculpt the pattern of intercalation algorithmically. A large number of Hellenic calendars were developed in Classical Greece, and later in the Hellenistic period, it gave rise to both the ancient Roman calendar and to various Hindu calendars. The Roman calendar was rehabilitated by Julius Caesar in 45 BC. The Julian calendar was no longer reliant on the observation of the new moon but it merely followed an algorithm of initiating a leap day every four years. This twisted a dissociation of the calendar month from the lunation. Gregorian calendar was the first calendar reform of the early modern era, which was named after Pope Gregory XIII, who introduced it in 1582. The Gregorian calendar is majorly used as a civil calendar in the most parts of the world. A complete calendar system has an altered calendar date for every day. Therefore, a week cycle cannot be recognized as a full calendar system. The simplest form of a calendar system just calculates the time periods from a reference date. This applies for the Julian day. Other calendars have one (or multiple) larger elements of time. Lunar calendars are synchronized in the motion of the Moon (lunar phases); one example is an Islamic calendar. Solar calendars are positioned on the basis of apparent seasonal changes, that are synchronized to the perceptible motion of the Sun; an example is a Persian calendar. Lunisolar calendars are based on a combination of both solar and lunar reckonings; examples include the traditional calendar of China, the Hebrew calendar and the Hindu calendar in India. The Gregorian calendar is the de facto international standard, and it is almost extensively used everywhere in the world for civil purposes. It is merely a solar calendar, that has a cycle of leap days in a 400-year cycle designed to keep the duration of the year aligned with the solar year. Each Gregorian year has either 365 or 366 days and the leap day being inserted as the 29th day in the month of February. However, its adoption in the early modern era was mostly limited to only Roman Catholic nations, but by the 19th century, it became widely adopted worldwide for the sake of convenience in international trade. In the year 1923, Greece was the last European country to adopt this reform. The calendar aeon used by the Gregorian calendar was inbred from the medieval reunion reputable by Dionysius Exiguus and was linked with the Julian calendar. The year number is diversely specified as an AD (for Anno Domini) or CE (for Common Era or, in fact, Christian Era). The most imperative utilization of pre-modern calendars is by keeping a track of the solemn year and for the observation of religious feast days. The Eastern Christians, including the Orthodox Church, use the Julian calendar. The Islamic calendar or Hijri calendar uses a lunar calendar, that consists of 12 lunar months in a year of 354 or 355 days. This calendar is primarily used to date most of the events in the Muslim countries, and used by Muslims all over the world to pin down a proper day on which they can celebrate their Islamic holy days and festivals. Whereas, various Hindu calendars which are in use in the Indian subcontinent, include the Nepali calendar, Bengali calendar, Malayalam calendar, Tamil calendar, and many more. The Buddhist calendar and the other traditional lunisolar calendars of Myanmar, Cambodia, Thailand, Laos and Sri Lanka are also the ones which are based on an older version of the Hindu calendar. The Julian, Chinese, Hindu, Hebrew, and many similar calendars are broadly used for religious and societal purposes. A fiscal calendar is nothing but a general calendar that represents the accounting year of a government body or a business forum. It is especially used for budgeting, maintain the record of accounts and for taxation. The fiscal calendar is a set of 12 months that can start at any date in a given year. While the fiscal year of the US government commences on 1 October and ends on 30 September, the Indian government's fiscal year starts on 1 April and gets over on 31 March. Some small traditional businesses in India begin their fiscal year during the festival of Diwali and it stretches till the next Diwali festival. Hope you’ve liked our article and got answers regarding use of Calendar and its different types. AstroSage wishes you a bright future.